KaseX is a symbol based technical analysis trading study with a simple, uncluttered display. KaseX captures dozens of complex technical signals in multiple time frames by interpreting the acclaimed Kase StatWare® technical indicators. Variable optimization is unnecessary as pre-configured sensitivity settings are built in. KaseX is great for pattern recognition based decision making that doesn’t require constant staring at indicators and related analysis. KaseX let’s traders know the risk associated with their trade and also displays Kaos Ratio, a measure of trendiness. 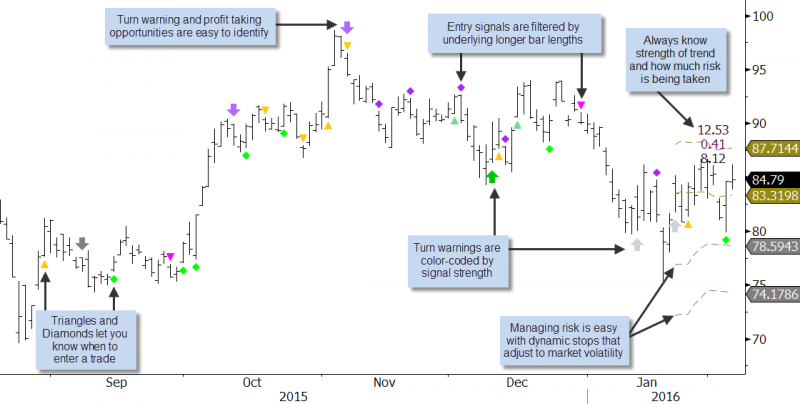 Color coded symbols show market condition relative to possible entries. Color-coded arrows warn of different levels of turn or reversal risk. Dashes show two stop levels that allow for managing risk and reward. Pricing depends on your charting platform and whether you are a private (retail), independent professional, or corporate trader. For pricing information please fill out the FREE trial request form.